Recently, I've been loving Illamasqua's Jo'Mina Nail Varnish. Jo'Mina is a sublime creamy electrified bright deepened pastel lilac with a reddish pink undertone. I've been wearing this polish for four days now and it hasn't chipped yet, a winner in my book! Jo'Mina is a gorgeous Spring/Summer shade and a color that I believe would look flattering on any skin tone. 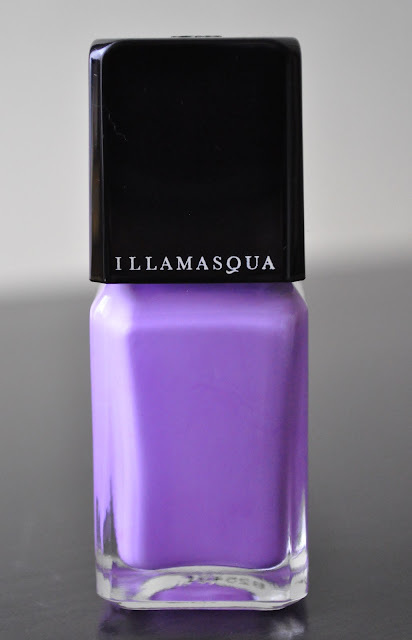 This nail lacquer retails for £13.50/ $14.00 (0.5 FL OZ/15 ml) and available at Illamasqua.com and Sephora.com. I love Illamasqua polishes!! Definitely one of my favorite brands. this colour ahhh i love! Do you own this one Jana? I almost bought this with renee when we went to Sephora, its a gorgeous color! I may need to get it! Erika, you definitely need this polish in your life!! hey there! i really like your blog! i found you through the blog hop! and thank you for the swtaches of the tarte blushes: that was needed! Stunning! The colour is so electric! It's one of my favorite colors for this season.